Bocke Lee Temjin, as depicted in Wonder Boy in Monster Land. 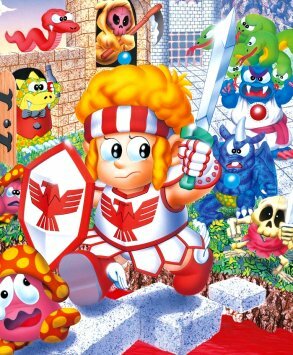 The second game in the Wonder Boy series. When an evil Dragon and his monster minions invade the land, a young warrior named Bocke Lee Temjin is asked to defeat him, a quest he accepts. This page needs a better description. You can help this wiki by expanding or clarifying the information given. Blind Idiot Translation: Some versions suffered from this. For example, the Amiga version used: "3 gold get." The English version of the arcade game (which was actually a pirated release) was barely intelligible. He may come from star. But, be careful. More tests wait for you. Bye! MONSTER LAND. So long. Boss Rush: The Final Dungeon, at least in the arcade version. Chain of Deals: One of the subquests. Country Switch: Playing the Japanese version, Super Wonder Boy: Monster World, on a western Master System will change the game's title and language. However, the translation displayed is completely different from the one in the official western version and the title is even slightly different (Super Wonder Boy: Monster Land). The Japanese version is also harder. Degraded Boss: Many of the key and sword guardians, especially in the Final Dungeon. Final Death: The arcade version disables continues in the final dungeon. Some ports, including the Amiga and SMS, have no continues at all. Guide Dang It: The sub-quests and hidden items, including the final sword upgrade. King Mook: The Myconid Master (giant version of the mushroom mooks), Giant Kong (giant ape), Kraken (giant squid) and King Demon (a promoted version of those one-horned ogre monsters). Life Meter: Yours is a series of hearts, while the enemy has a colored dot. Some ports removed the dot. Loads and Loads of Loading: When completing a world on the Amiga port. Market-Based Title: A bit of a confusing example. The original arcade game was simply titled Wonder Boy: Monster Land in Japan and it became Super Wonder Boy: Monster World when ported to the Mark III. Overseas, the Master System version was released as Wonder Boy in Monster World, but the Japanese cartridges feature an early build of the English version titled Super Wonder Boy: Monster Land and some cartridge labels even misprinted the title as Super Wonder Boy: Super Monster Land. The home computer ports by Activision were released under the name of Super Wonder Boy in Monster Land on their packaging, but the actual in-game title varies between versions. The Maze: The Final Dungeon. Incorrect paths return you a few screens or possibly back to start. Mercy Invincibility: The arcade version prevents damage, but still applies Knockback when you hit a projectile or monster. Palette Swap: Some of the monsters, such as the knights and the kongs, have recolored variants. Pop Quiz: The Sphinx Puzzle Boss. Robotic Reveal: The Final Boss. One-Winged Angel: the Robotic Reveal takes place when the boss is defeated for the first time. Then you have to fight it again. Spell My Name with an "S": The hero's name. The arcade game spells his full name as "Bocke Lee Temjin" (with "Book the Hero", the name given in the instruction card, being his nickname) in the casting roll, while the manual for the Master System version spells it "Bock Lee Temjin" (removing the "e" from "Bocke"). Some of the enemies have their names spell differently as well.